World leaders will tackle climate change in Paris from November 30 to December 11. As environmentalists say, any issues related to Mother Nature are both local and global. The World Bank, a UN development body, is partnering with Central Asian governments and development organizations to strengthen energy and water security. It is allocating $38 million from its International Development Association to finance the first phase of the Climate Adaptation and Mitigation Program for the Aral Sea Basin. The project includes $9 million for Tajikistan and $14 million for Uzbekistan, and $15 million for regional activities. VOA’s Navbahor Imamova talked to Kulsum Ahmed, lead environmental specialist at the World Bank, about the most critical issues facing the region. Navbahor Imamova, VOA: As we look at the map of Central Asia, we see a huge area which has about 70 million people living in it. Obviously the region has many environmental issues. If we were to look country by country, what would you say are the most pressing problems in each of them? Kulsum Ahmed, World Bank: Actually there are lots of environmental problems, but they are similar so I’m going to talk regionally. I want to talk of three things – climate, natural resource management, and pollution. Because the problems are similar across the countries, I’m talking first of climate. You know that the waters in the region are fed by glaciers and by snow. You have the snow fall in winter and it stays there on the mountains locked away. When it gets warmer it turns to water and comes down in the growing season when it’s needed. When it gets too warm, it comes too fast which causes floods. In the growing season when you need the water, there isn’t enough, so you get droughts. You get both floods and droughts. Average annual temperatures are much higher – 0.6 degrees higher in the South and 1.5 degrees higher in the North. Since the 1900s the glaciers have lost a third of their volume and we’ve had those floods and droughts in the lowlands. That, I think, is a serious challenge now, but looking forward it’s going to be an even bigger challenge. The World Bank came up with a report called “Turn down the heat: Confronting the new climate normal,” which projects that the glaciers could lose 50% of their volume in a 2°C warmer world. If the world is 4°C warmer they could lose 75% of their volume. There will also be periods of heat extremes. Altogether there’ll be too much water coming down too quickly and in the latter half of the century there’ll be too little water because the glaciers won’t be there. Navbahor Imamova, VOA: How do you start addressing these issues? What can the governments in Central Asia do to decrease the effects of global warming in the region? Kulsum Ahmed, World Bank: Global warming, firstly, is a global phenomenon. It’s very difficult to keep the air in one place since it goes across boundaries. The environmental challenges of land use and air and water pollution are massive in the region, but the governments are already doing a lot about it. With pollution you have to look at two aspects. There’s what I call stock, which is pollution that’s already in the ground. That’s happened historically from heavy industries, extraction, and mining. Then there’s the flow, which is the pollution that’s happening now. Countries and governments typically tackle that by strengthening their environmental regulations and enforcing them because they have to give all the right signals for people not to behave badly, so to speak. In terms of this pollution, the governments are beginning to do quite a bit already. Navbahor Imamova, VOA: Any examples? Kulsum Ahmed, World Bank: The Bank, working together with the government of Kazakhstan, supported a project to clean up the mercury pollution from the Nura River. That was a carbide factory for 50 years producing around 1500 tons of mercury that went into the water system. You can imagine with a population around 170,000 people in that area, and mercury, as the WHO has said, affects the central nervous system, liver, and kidneys. Through that project 2 million tons of contaminated soil in a 3500 hectare area were cleaned up. So you can do something about it – it’s tough, but governments are trying. Navbahor Imamova, VOA: What you hear a lot in the region is that ‘we’re a predominantly agricultural country so we don’t have to worry about industrial pollution.’ But at the same time farmers complain about the lack of water when they need it, erosion, and the quality of the soil. These are major environmental issues for the region too, aren’t they? Kulsum Ahmed, World Bank: Absolutely right. Actually, 50 - 75% of that population you talked about in the region lives in the rural areas and are mainly subsistence farmers and pastoralists. The Bank just came out with a report this week called “Shock waves”. It looks specifically at climate and the effect of climate shocks on poverty. The report says that the shocks of changing climate can affect the gains we can get from poverty eradication. If you’re a farmer and your crop doesn’t grow, if there isn’t enough water or it floods, it’s a massive economic loss. It’s what brings people back down into poverty or keeps them in poverty. These are absolutely critical issues that apply very much in this region. Navbahor Imamova, VOA: We know that the World Bank runs several projects in this sphere, could you talk about some of them? Kulsum Ahmed, World Bank: There’s one focused on this exact issue that’s actually ongoing, and one that recently closed. The ongoing one is an environmental land management and rural livelihoods project in Tajikistan. It’s helping predominantly farmers in the rural areas improve land management practices so that water is used more efficiently and there is less soil erosion. Already that project has reached 35,000 people, beneficiaries. Navbahor Imamova, VOA: That’s not much. Kulsum Ahmed, World Bank: It’s not much, but 45% are women. I think that’s also important. A project in Kazakhstan focused on forests because tree roots hold the land so that you don’t get the landslides when there’s too much water, and help to decrease saltation in the rivers. Forests also provide energy in terms of heat for the families, or gets used for other economic products. This project mainly focused on rehabilitating Irtysh Forest and helping with better land management practices in the range lands. That project was just closed, covering 250,000 hectares of land. 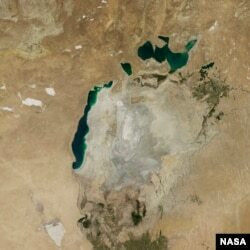 One of the areas was actually linked to rehabilitating and revegetating the Aral Sea bed. It was really interesting because it was a project in Kazakhstan coordinated with Uzbeks to see how they could get the rehabilitation and vegetation going, and how they could attract that diversity back. So these were two examples of ongoing or just recently closed projects, but the one I want to tell you about was approved on the 3rd of November. It’s the Climate Adaptation and Mitigation Program for the Aral Sea Basin. That project essentially tries to build awareness among stakeholders, who are farmers to government agencies, for both climate change and appropriate responses. It also tries to help people, particularly in rural communities, to be more climate resilient. It involves all the five countries in this first of the series of projects. Uzbekistan, Tajikistan and the Executive Committee for the International Fund for Saving the Aral Sea are the recipients of the program. Navbahor Imamova, VOA: So, in stage one it’s Uzbekistan and Tajikistan. For a lot of people who don’t understand or know much about this, when you talk about the Aral Sea Basin, they don’t necessarily think of Tajikistan. Are we talking about all of Central Asia? Kulsum Ahmed, World Bank: Yes, absolutely. It’s the Aral Sea Basin, which is a geographical area that covers all of these five countries. Navbahor Imamova, VOA: The drying of the Aral Sea has undoubtedly been one of the most devastating disasters of our time. You’ve been studying the region for a long time, has there been any progress in terms of saving the area? We know that the sea is continuing to dry but we also know that there has been some progress on the Kazakh side. We’ve been talking about how bad things are for a long time and we keep on repeating the same facts. But the international community has also been working on it for decades. Do you see any progress? Kulsum Ahmed, World Bank: I’m not an expert on the Aral Sea. We do have experts on that, but what I can tell you is that climate really involves two or three things. One is being much more efficient in terms of our use of these resources. This area suffers from water and energy intensive, which means that you’re not really maximizing the economic production that you can get from using that water. So, I think a major path forward in terms of being more resilient to climate is being very conscious of your water and energy use at an individual level as well as at a broader community and business level. Just being conscious that those drops of water or the energy that you use needs to be conserved and used. It’s a very precious resource. Sometimes we think of lots of things as being available. When you’re washing your hands and the amount of time it takes or even the amount of water that just goes through, there’s simple things likes that which make a huge difference at an individual level. As we talk about communities and businesses being more conscious of their waste and whether the handling of emissions abides with the regulations, ultimately the environment is about the future of Earth and the future of our children. Navbahor Imamova, VOA: So accountability is a major factor here. How to hold who accountable for these issues? Obviously you have to hold the relevant sides accountable so that you can start working on the solutions. Kulsum Ahmed, World Bank: I think accountability lies with everybody. Accountability is about doing the right thing, and doing the right thing at every level. So accountability lies with the individual, communities, the private sector and the government. The government has a role in terms of putting in place regulations to change behavior so that people are more conscious of resources, and also of sanctioning bad behavior. Navbahor Imamova, VOA: And, of course, the decision making lies with the governments mainly. We know that the World Bank has been running several projects over the years with the countries, and now there is more focus on regional projects. How different are they? And what are the challenges in running them? Kulsum Ahmed, World Bank: The land and water resources are connected in this region so tackling it together and realizing there are common challenges and solutions becomes very powerful. That’s why this regional climate program I was telling you about is so exciting. The countries themselves asked the World Bank for such a project last May in Almaty, because they realized that they did have common problems and needed to solve them together, and that they needed information to do that. In terms of regional projects more generally, the biggest challenge is to actually be flexible, so that you get a common vision but each of the countries can move at their own pace. Different countries have different needs and approaches, and it takes time. You want the ones who can run to run and the ones who want to go slowly to go slowly. But everyone to do it with that common vision. That’s probably the biggest thing to bear in mind. This particular project is designed that way, starting with these two countries and follow-up projects in the other countries already under preparation. 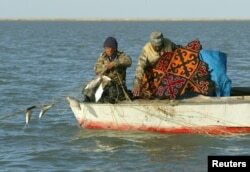 Kazakh fishermen pull a fishing net from a boat at Kokaral near the village of Karateren, southwestern Kazakhstan. Once the world's fourth largest lake, the Aral has shrunk so much that it has now split into two separate bodies of water. Navbahor Imamova, VOA: When should we be expecting the initial results? When do you know it is working? Kulsum Ahmed, World Bank: We have a very good set of indicators by which to measure success. I think that in a way tells you more about the project than what one is hoping for in the future. The first is just how much knowledge services are used under this project. A regional coordination unit will be set up and then all of the information will be available to all of the countries and all of the stakeholders, whether it’s farmers or government agencies. The second indicator is how countries are taking those knowledge services and using them at a country level in their own programs and plans. So taking that knowledge of climate and applying it. The knowledge is not just being generated within the project, but it will also be a place where others can go for climate information. These individual investments and technologies that farmers would pilot apply to all of the countries, but how that information makes it to their own country-led programs and plans is a measure. The third measure is how much countries take this and work together with each other in order to maximize synergies. So not just at an individual within a country level but two or more countries getting together to look at how they apply solutions and pay policies, or whether a project is transboundary. The final thing – the whole idea is to attract even more information, knowledge and money to this area so we’re going to track what comes in beyond what is already being generated under this project. Navbahor Imamova, VOA: The World Bank is the main facilitator for this project, not the countries? Kulsum Ahmed, World Bank: The World Bank provides support through loans, credits, grants, in this case submission of grants and credits. The people who are doing the project are the countries. Navbahor Imamova, VOA: So the technical work is being carried out by the countries? Kulsum Ahmed, World Bank: We are providing resources and we work with and support countries in their efforts, but everything is done by them. The World Bank team worked with people from all of these countries to design the project. Within that project program there’s credit lines for farmers to pilot new technologies and communities within each of the countries. There is one knowledge-sharing facility. The money for that is going through EC-IFAS together with CAREC, Regional Environment Center for Central Asia. They’d have a regional coordination unit in Almaty and that would be where these knowledge services would be available for everybody. The whole idea for the climate forum in Almaty in May 2014 was that people from each of the countries sat and wrote together what they wanted and also decided which areas to focus on first. They said land management issues were important for all of us, so let’s focus on this, we’ll do all these pilots in our countries but share the information and what comes out of it. The program is also supporting the generation of data, for example glacier melting. Uzbek farmers work at a cotton field in the village of Chinaz, some 80 km (50 miles) west of capital Tashkent. Uzbekistan is the world's third-biggest cotton exporter. Navbahor Imamova, VOA: As someone who’s been studying this field and focusing on Central Asia, do you see a young generation of experts, who are working on these issues in the region? Obviously, in each country, you need good specialists and people who are going to carry out these tasks, from making people aware to saving the environment. Kulsum Ahmed, World Bank: You’re absolutely right. This is crucial because it’s ultimately people that make the difference. I’m finding there’s been a lot of interest as our teams have gone out and talked about climate. I see quite a few on the education site, you have much more focus on this. Globally, this is something we see much more of an interest in. I hope that this also happens in Central Asia and continues, because ultimately it’s the people. You need the professionals, but it’s also just ordinary people understanding that the resources we have are scarce and that we need to conserve them so we can leave something for our children. That you don’t need to be an expert for. Navbahor Imamova, VOA: Thank you so much for talking to us. Ambassador Richard Hoagland - Central Asia: What's Next?